Wake up in the morning and stretch; your midsection narrows. Pull on a piece of plastic at separate ends; it becomes thinner. So does a rubber band. One might assume that when a force is applied along an axis, materials will always stretch and become thinner. Wrong. Thanks to their peculiar internal geometry, auxetic materials grow wider when stretched. After confounding scientists for decades, University of Malta researchers are now developing mathematical models to explain the unusual behaviour of these logic-defying materials, unlocking a plethora of applications that could change the way we envision the future forever. Auxetic materials have the amazing property of a negative Poisson's ratio, becoming fatter when stretched. This comes from its structure which in the Malta-developed model is represented by a series of connected squares, technically called rigid, rotating subunits. When the subunits turn relative to one another, the material's density lowers but its thickness increases. Auxetics caused such colossal confusion among researchers that it went ignored for years. It was only in the 1980s that auxetics were picked up again as practical application resurfaced. Recent advances are unlocking this material's potential. In a paper published last week in Nature Publishing Group's journal Scientific Reports, mechanical metamaterials, chemistry professor Joseph N Grima, together with his team at the University of Malta, have presented a mathematical model of auxetic behaviour using hierarchical rotating unit systems. These systems take advantage of the enhanced properties provided by a negative Poisson's ratio but also use a hierarchical system whereby the complex structures are created from the simpler units, thus creating a hierarchical auxetic metamaterials that are more versatile in terms of their mechanical properties, with experts being able to control and alter them. Emeritus Professor Anselm C Griffin (Georgia Institute of Technology, US), notes how Grima's work "represents a huge step forward in the conceptualization and design of a new class of metamaterials." "With the realistic prospect of tailorable auxetic mechanical properties as described in this paper, the potential for applications of these new metamaterial structures particularly in biomedicine and catalysis is quite exciting," he added. 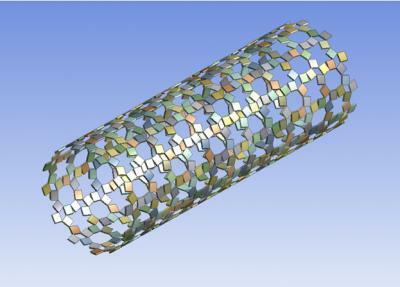 Materials Chemistry Professor at Oxford University in the United Kingdom, Andrew Goodwin, notes its "exciting [applications], how fractal-like assemblies of simple [shapes] might find application in smart medical stents and ultralight responsive supports." In principle, he said, the ideas Grima and his team are working on could also be applied to atomic-scale assemblies as they do in life-size structures. Chemists and engineers will be working closer together to develop the smart materials of the future, he added. For Grima and his team, this innovative approach has one main application: healthcare, and more specifically skin grafts. This procedure involves the removal of a patient's undamaged skin and using it to treat another severely damaged area, as in the case of burns. "Current methods don't allow for the skin to be used as optimally as possible, which is not ideal when larger skin sections are needed. Our work potentially could reduce the amount of good skin needed to treat the injured area," remarks Grima. The mathematical model is a solid foundation, but the real world material could always vary. To test that out, the team is 3D printing the designs. Grima said that they are already "managing to approach the ideal systems in a very cost-effective manner." Despite the present success and the great potential it has unlocked for the future, the journey ahead for Grima and his team remains a long one. The next step is to further develop the auxetic structures then manufacture the materials industrially. "We see a future where real-life applications of auxetics will be rife", states Grima. While these materials seem illogical, their path into the mainstream seems fairly straightforward. The ultimate aim? To improve people's lives. Logically.